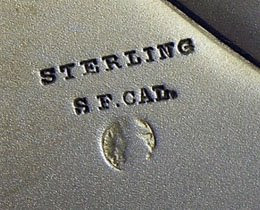 Christopher Dresser had a huge influence on design in Britain and America and until recently I was not aware of his collaboration with Edward Moore of Tiffany. 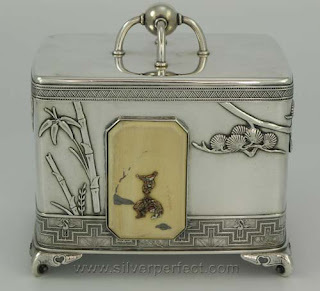 This rare and important Tiffany tea caddy has Japanese influenced applications including the decorated ivory plaque on the front with two copper jesters. The ivory plaques are rumored to be part of a large purchase made in Japan by Christopher Dresser on behalf of Edward Moore for Tiffany. The futuristic sputnik finial looks as if it was inspired by the novelty toast racks that James Dixon of Sheffield made from Christopher Dresser designs. 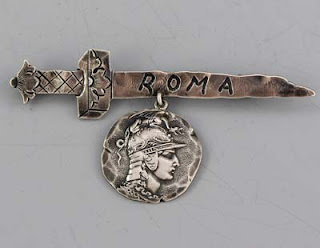 George Shiebler's engravers used Roman and Greek related words on their Etruscan pattern flatware, hollowware and jewelry and many people are curious as to the purpose and meaning of the words. After acquiring quite a few pieces and checking around I think I can safely say that the words are meant to look as if they were dug up with the old Roman and Greek pots and pans in an excavation. The letters of the alphabet appear Greek or Roman in style but the words are meaningless. 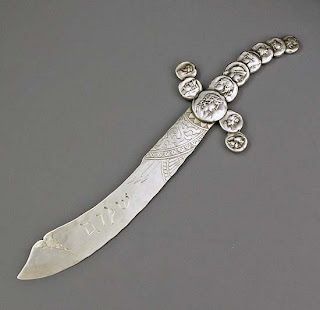 I found a letter opener and paper knife with the Hebrew word Shalom inscribed. That was a first for me. The medallions in the Shiebler Etruscan pattern have many varieties but the Roman centurion is quite clearly just that. The Greek medallions look like the ancient Greek busts. Conclusion: After looking up the meaning of the word Etruscan, I learned that the Etruscan period refers to a culture that developed in Italy in about 800BC. This was followed by a period of Greek influence in Southern Italy dominated by Greek traders. 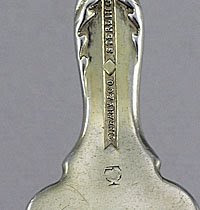 In the early 1980s few museums would give up shelf space to American Silver. This was a great pity. 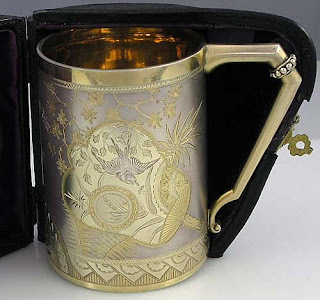 I remember visiting prominent museums and seeing row after row of boring tankards; all the same, lined up like soldiers. Any collector with an eye for the unusual would take special notice of the Japanese movement, and the Arts and Crafts movement of the late 19th century. Finally there was an awakening spearheaded by the Dallas Museum in 1989 with the Christies sale of Sam Wagstaff's collection. I heard a story from a dealer who has since passed that when she was planning to send her children to university, she invited Sam to her vault and opened up her drawers of silver flatware for him to pick through. Naturally he chose the best with an eye for what was great and important. The Sam Wagstaff sale catalogue is still one of the most sought after Christies catalogues today and used as a reference book. 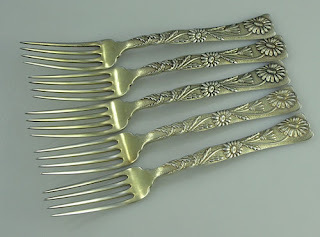 While British makers such as Elkington had a few great moments manufacturing special pieces of the same period and designs, the American makers like Whiting, Shiebler, Gorham and Tiffany were way ahead in design and technique. 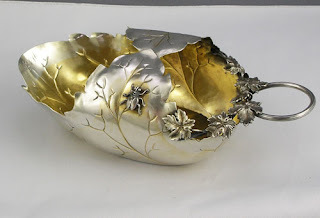 Antique shows are an excellent place to meet up with very experienced dealers. At most of the larger conventions like the Miami Beach and other Florida shows a collector can have fun meeting up with some real characters. Most of the dealers I know have been in this business for just about 30 years. Many started off as kids as I did in 1979. They have had such exposure to the market that it is a shame that there is no law that makes it mandatory for them to put their memoirs in writing. I would match them up against the most experienced licenced appraiser any day. Knowledge that one gets off the street is just as valuable as information one can read up in a journal or a book of rules. Getting to the top of the food chain is also expensive. The dealers that get to the top make mistakes along the way. As painful as this can be at the time, these mistakes fortify them against future mistakes and make the dealer sharper. Other great shows are the Baltimore Summer Antique Show on Labor day week end. Here one can find almost every silver dealer in the country under one roof. Unique opportunities and with the world becoming a more expensive place every day, it would be advisable to attend before it is too late and before the Internet takes a toll on these events. I hope you find these notes helpful. 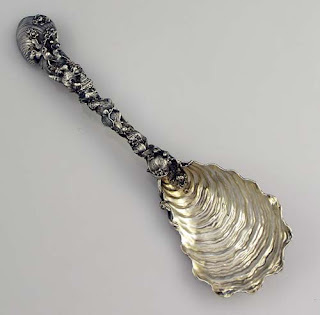 Feel free to e-mail questions about Antique Silver.